An important antioxidant and filter of blue light. It is rich in Lutein - a carotenoid found in dark green leafy vegetables like spinach. Lutein can help protect the retina from UV damage, Studies show that Lutein can reduce the risks and effects of Age Related Macular Degeneration. Eye support comes by way of an easy to swallow gluten-free capsule. Body By Natures eye support supplement contains high amounts of health-promoting antioxidants including Vitamin E which is most powerful. The antioxidants found in vitamin E are known for decreasing the likelihood of developing cataracts and age-related macular degeneration. Our whole-food product also contains the beneficial carotenoid Lutein. The anti-oxidants found in Lutein are known for increasing circulation to the eyes Bilberry is present in our supplement and may benefit those who have macular degeneration or are predisposed to a cataract. Phenolic compounds in bilberry are of benefit as antioxidants. Additionally Zeaxanthin, a plant-derived yellow pigment with high antioxidant activity found in our specially formulated supplement supports eye health and crystal-clear vision. It has also been known to benefit patients with macular disease and is currently linked with reducing the risk of age related macular degeneration (ARMD). Our Eye support also contains grape seed extract: A powerful antioxidant and has a particular affinity for blood vessels. 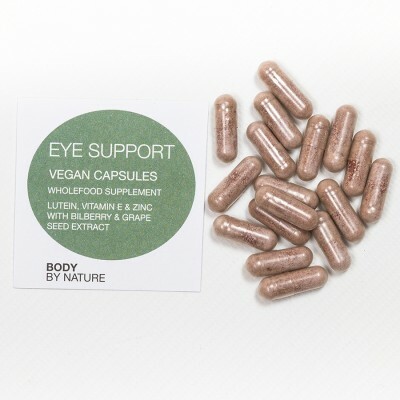 Eye support contains a potent mix of Carotenoids and flavonoids found in humans and plants which helps to retain intracellular communication and protect against damage from UV light. 1 capsule daily as a food supplement, or take as directed by a practitioner. Do not exceed the recommended daily intake. This product should not be used as a substitute for a varied diet. Men, Women, Children and the Elderly. Wheat; yeast; startch; gluten; soy; lactose; added sugars, colourings, flavourings & preservatives. Keep cool, dry and out of direct sunlight. No need to refrigerate. Keep out of reach of children. If seal is broken on purchase do not use.